The Discover Massage Australia store stocks a great range of DVDs on massage and massage-related topics. There’s no better way to learn or to brush up your existing skills than by watching a step by step instructional video from the experts. It allows you to learn at your own pace and study particular techniques and treatments all from the comfort of your armchair at home. Our range of DVDs also includes the comprehensive 16 video DVD set ‘Your Pathway to Massage Excellence’. This exclusive collection covers the material in our Whole Body Massage Course and shows how to give a full body relaxation massage using the unique techniques and systems developed by Discover Massage Australia. Including 3 bonus treatments not taught in class, it’s only available to DMA students and is a great tool to refine, refresh and enhance the skills learnt in our courses. Discover Massage Australia is the country’s largest private massage training college, producing thousands of graduates over the course of twenty years or more; all of whom have gone on to become highly successful practitioners. We regularly operate over 60 massage courses in all major Australian centres including Melbourne, Sydney, Canberra, Adelaide, Perth, Brisbane and the Gold Coast. Our courses are run by the best teachers in the business; experienced massage therapists who want to see their students excel and our company mission and lifelong goal at DMA is to continue producing the most skilful massage therapists in Australia. As well as teaching beginners, DMA also offers advanced training courses for professional already practising in the industry. These courses can help them to widen their existing skill sets and learn advanced techniques used in the treatment of specific injuries. So whether you’re just starting out or are an experienced therapist, we have training that’s tailored to your needs at Discover Massage Australia. 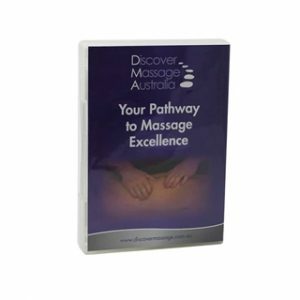 Whether you’re looking for a DVD on the art of massage or the equipment you need to practise your craft, you’ll find what you’re looking for in the Discover Massage Australia store. And if you’re looking for a new career in massage therapy or seeking a course to further your current skill level, browse our website for the next available course in your area. But be quick, because places fill up fast.